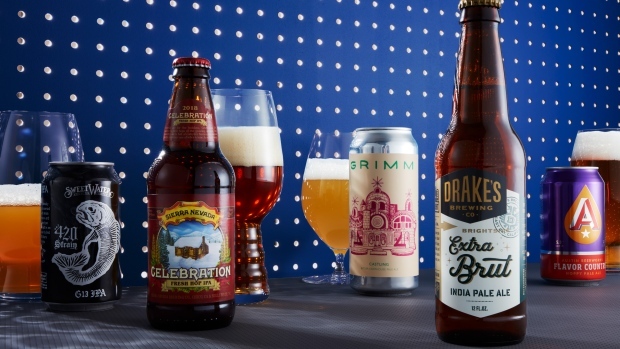 Weed beers were a big trend in 2018, with brewers applying various marijuana derivatives such as CBD to a variety of styles and creations. The most successful of these, in terms of both execution and sales, was SweetWater’s 420 Strain G13, an uber-dank American IPA (named after the brewery owners’ favorite weed strain) which incorporates botanically sourced terpenes from a variety of plants to mimic the G13 cannabis strain aroma but no actual THC. The terpenes, organic compounds responsible for lending plants their unique aromas, give this beer an over-the-top whiff akin to the stickiest dime bag you’ve ever opened. On the palate, the beer is mellower, marrying the marijuana notes with strawberry, white grape, and pineapple flavors. Given the continual mainstreaming and decriminalization of cannabis, it’s perhaps no surprise that within months, G13 became SweetWater’s second-best-selling beer. Style: Brut IPA 7% ABVBrewery Location: San Leandro, Calif.
Brut IPA was another hot sub-genre in the gangbusters IPA category. Born out of the Bay Area—props to brewers Kim Sturdavant of Social Kitchen and Brewery and Tim Sciascia of Cellarmaker Brewing for inventing the style—this hybrid IPA style combines the big aromatics of New England IPAs with the clean, crisp briskness of their West Coast cousins. John Gillooly of Drake’s Brewing created one of the best examples: pale, stripped-down, and highly effervescent, with notes of white grape, pine, and stone fruit. Style: Fresh Hop IPA 6.8% ABVBrewery Location: Chico, Calif., and Mills River, N.C.
There’s an old myth among beer nerds that the recipe for Sierra Nevada Celebration Ale changes from year to year. It doesn’t, at least not in terms of the base formula, but it does incorporate the year’s freshest hops from different areas of the world, harvested at different times, so batches can vary slightly, even within a single vintage. The first batches of 2018 (brewed with only hops, malt, water, and yeast—no holiday spices, despite what the packaging may indicate) struck me as particularly heady and beautiful, handily outshining other recent vintages. The amber-hued IPA bursts with pine, grapefruit, and caramel aromas; best of all, it’s a six-pack you can pick up at nearly any bodega, grocery store, or pharmacy in the country. Lupulin powder, a high-tech concentrate of cryogenically extracted hops resins and oils, is a game changer for modern brewers. It can add big bouquets of fruity, potent hops without much bitterness. And it’s the reason this supremely hoppy pale ale from Austin Beerworks tastes so modern, refreshing, and invigorating. The hops are your run-of-the-mill Centennial, Citra, and Mosaic, but the end result is ethereal. Style: Belgian-style Pale Ale/IPA 5.5% ABVBrewery Location: Brooklyn, N.Y. It was a big year for Brooklyn’s Grimm Artisanal Ales, owned by married duo Lauren and Joe Grimm. The former roving (contract) brewery finally settled down in East Williamsburg with the absolute sleekest taproom design in the city—patiently brewing batch after batch until any flavor hiccups were smoothed out. Transitioning from gypsy brewing to brick-and-mortar let the company bring back star one-offs like Castling, now being packed on its canning line. A tough cookie to crack, it’s ostensibly a “farmhouse ale” but with big peppery notes of European hops that ebb and flow as the beer warms in the glass. Fans of Belgium’s De La Senne Taras Boulba pale ale and anything from France’s Brasserie Thiriez will find much to like in what I’m calling a true Belgian-style IPA. Style: German-style Pilsner 5% ABVBrewery Location: Richmond, Va.
Ardent has quietly been making the best beer in Richmond—the new craft beer mecca of the American South—for years. The brewery isn’t flashy or tricked-out like many of its Instagram-ready neighbors, but is instead solid and resolute, unswerving in its dedication to sensible ales and lagers. The results are often exquisite. Take Pilsner, its best new beer of 2018. This is an exercise in perfecting a deceptively complex style, with delicate but layered aromas of grassy, noble hops and a soft bitterness. Style: Pilsner 5% ABVBrewery Location: Brooklyn, N.Y. In June, Brooklyn’s Threes Brewing announced a grassroots initiative called People Power, open to any brewery across the country who wanted to participate, to make beers to benefit the ACLU. The idea was for the breweries to release the beers twice—first on July 4 and then on Nov. 6, Election Day—with 10 percent of the proceeds going to the People Power division of the ACLU. Threes, one of the country’s most adept lager brewers, crafted a pitch-perfect Pilsner perfectly suited for July 4 cookouts. The second batch, released in November, was even better, with crisp notes of straw, honeysuckle, and green tea. Though the final donation tally isn’t finalized yet, 84 breweries from 30 states participated in the noble effort. Style: Italian-style Pilsner 4.7% ABVBrewery Location: Portland, Ore. Proof that there’s still room for innovation in Portland’s oversaturated beer scene, this newcomer brewery opened in 2017, courtesy of Double Mountain co-founder Charlie Devereux, Relapse Records’ Matthew Jacobson, and restaurateur Rodney Muirhead. It quickly became one of the hottest breweries in the perennially white-hot market. The focus isn’t trendy New England IPAs (though Wayfinder does make some good versions of those), but clean, classic, low-ABV lagers. The flagship Czech Pils is an exemplary bitter and spicy brew with loads of Saaz hops, while Hell is a crushable helles-style lagerbier. 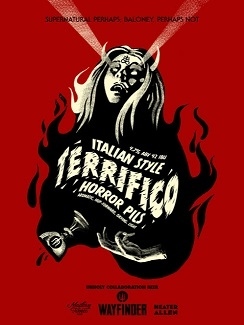 One of the best beers from Wayfinder was Terrifico, a three-way collaboration with esteemed lager brewery Heater Allen and Modern Times (which opened a taproom and brewery in Portland this year). The bright, floral pilsner is inspired by the cult Italian pilsners of Birrificio Italiano. Dry, pithy, and a touch campy, it’s just like a spaghetti Western in a glass. Table beers—stripped down, saison-like farmhouse ales—are rarely exciting. They can be boring and bland, even if perfectly executed, a bid to pair with the widest variety of food. But somehow Seattle’s Holy Mountain found a way to create depth and complexity within the style that few others can achieve. This light-bodied beer has big effervescence and layer after beguiling layer of stone fruit, clove, and hay. The fact that it’s below 4% ABV shows that even little beers can be total knockouts. Philly’s Fermentery Form is proof that small, specific, niche breweries can continue thriving in an increasingly competitive—dare we say saturated?—market. The brewery doesn’t make a single IPA, is open just two days a week (down a back alley in the city’s Kensington neighborhood), and doesn’t even brew its own wort. (It partners with a nearby brewery for that.) Where it excels is its focus on esoteric styles, mostly Belgian- and French-influenced, such as this barrel-aged golden ale blended in the solera method. 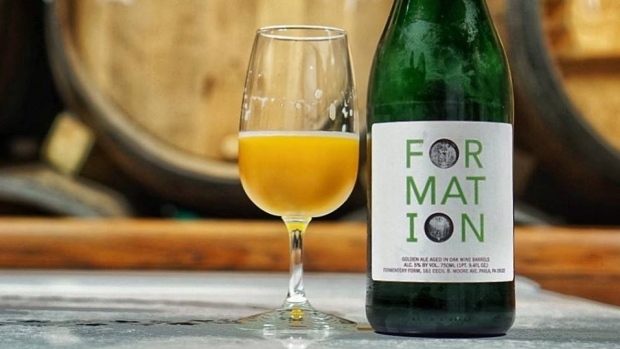 Formation mimics the flavors of the best lambics in the world without following any of the traditional lambic-brewing processes (turbid mash, spontaneous fermentation). The result is a complex and heady beer, at once balanced and funky, with notes of lemon and earth. Style: Imperial Milk Porter 11.6% ABVBrewery Location: Paso Robles, Calif., and Athens, Ga.